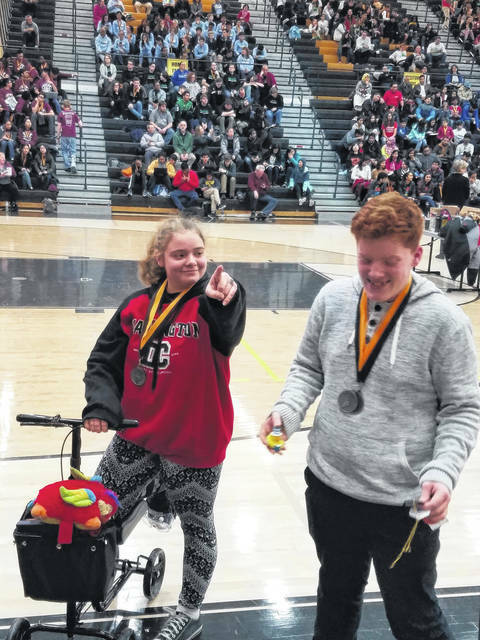 Sydney Gross and Ben Loudenslager joke around after winning second place in “Write It, Do It” at the Centerville Science Olympiad Invitational last Saturday. CENTERVILLE — The Northmont Middle School Science Olympiad teams continued their season with participation in the Centerville Science Olympiad Invitational held at Centerville High School, on January 12. This Invitational was exceptionally difficult, as the competition field included multiple teams who were champions in their home states in 2018. The state champion teams hailed from Florida, Illinois (two teams), Michigan (two teams), North Carolina, and Ohio (two teams). The Northmont Middle School team finished in the top half of the field, with 452 points, and placed 20th out of 43 teams participating. At the competition, Cleveland area Solon Middle School, 2018 National Champions, won the division with 90 points. In total, Northmont took home medals or ribbons in four of the 23 events of the day. The Northmont strength came through with multiple sets of winners. 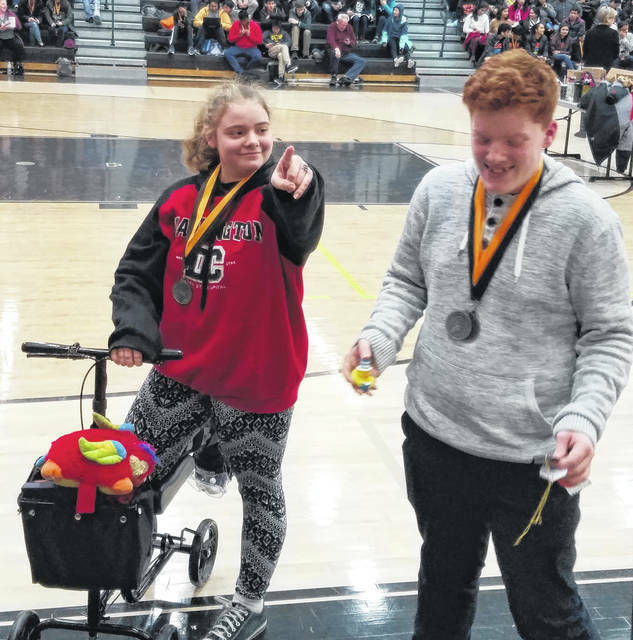 In the “Write it/Do it” event, ninth graders Sydney Gross and Ben Loudenslager scored the highest win for the team, earning a silver second place medal. In addition, Loudenslager teamed with eighth grader Lia Yang, to win a bronze third place medal in “Potions and Poisons.” For the build events, Loudenslager paired with seventh grader Karsten Strobel to place sixth in “Boomilevers”; and finally, in the “Fossils” event, Loudenslager partnered with his brother Alex Loudenslager, to earn the seventh place ribbon. The Northmont Middle School team travels to Westlake for its next competition at the end of January.